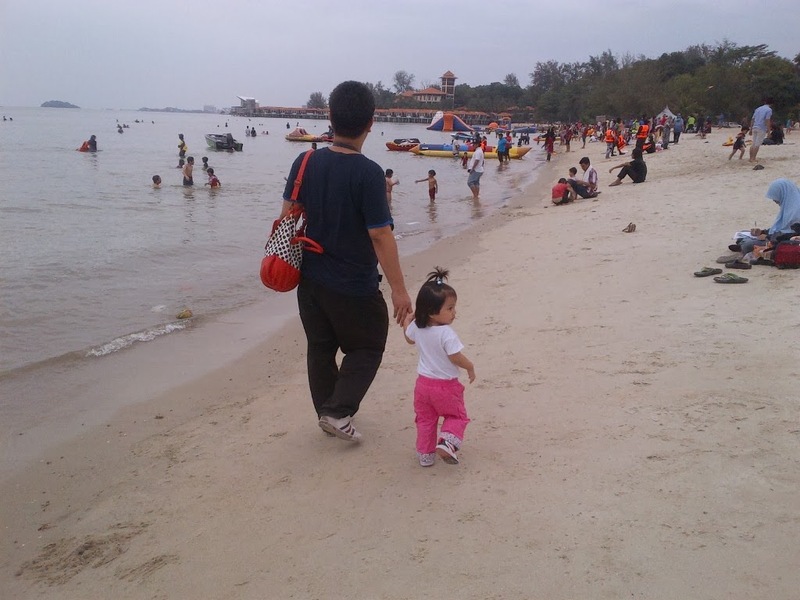 Last Saturday we went to Port Dickson (PD) for a short trip. Hubby asked us to get ready and said we'll go to see some animals. I ask, "where?" He said "Colmar Tropicale." But that was already 3ish pm and it was a bit cloudy outside. I said to him by the time we reach there, it might already be closed and what if it rains? Then he said, "Ke u nak pergi beach?" I said "which beach?" "PD". OK set. We quickly got ready, I made nescafe in our hot cup, packed Babycakes spare change of clothes, diapers and milk and off we went. My husband loves to take us on an impromptu short trips over the weekend. We've been to Genting Highlands on a short notice a few times already. Good thing that Babycakes napped along the way and by the time we reached PD, she woke up refreshed. 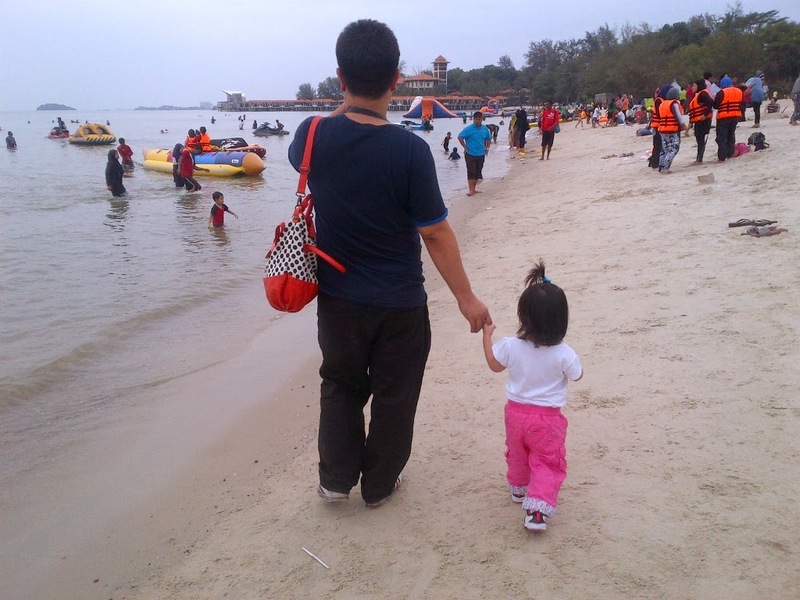 Instead of going to Teluk Kemang Beach, we decided to go to Pantai Saujana. The beach was bustling with activities, there were so many people on the beach and there was a pasar malam (night market) opposite the beach. Perfect! We strolled along the beach and watched people burying themselves in the sand, people swimming and playing balls on the beach. However, the beach wasn't very clean as there are litters scattered on the beach. So disgusting. There was a playground and we let Babycakes play. After a while, she got knocked down by another kid after going down the tube spiral slide. Unfortunately the kids' parents didn't monitor their kids. Kids, being kids, didn't know that they were supposed to wait until the slide is clear and the person before them had got off the slide before they could come down. So yes, Babycakes cried. While Babycakes were playing, I went to the toilet to pee. The fee was 50sen but if you want to bathe, you have to pay RM1. When I entered the toilet, to my utter shock and disgust, the toilet was packed, stuffy, people were queuing and there were only three freaking cubicles available! At the place where you can take your wuduk (ablution), some people were squatting bathing their kids and themselves. There were clothes hanging everywhere. At the sink, also there were people bathing and squatting using a rubber hose and one kid was bathing inside the sink. I just couldn't take it, I left. If I were to wait, it'll take forever. I should have asked for a refund considering I didn't pee and didn't even use the sink. It was just too disgusting and a horrible sight. I am so gonna write to the Majlis Perbandaran Port Dickson to improve this. There were a gazillion people on the beach, covered with sand and whatnot so good luck to them! Unless they won't mind getting into their cars in wet and sandy clothes. Bleughhh. I told hubby, that's it, I need to find another toilet to pee! We then crossed the road and went to the nearby Petronas because Babycakes was whining for Ribena. I won't mind drinking the drinks sold at the pasar malam for myself but I don't think I'd want Babycakes to drink them. After that we went to have an early dinner at one of the restaurants, all within walking distance. The foods was OK but I won't recommend it. We went to the pasar malam and thought of buying some apam balik and putu piring but we were already full. So we bought some grapes and corns. There were a row of stalls selling all sorts of T shirts (there's even a Hard Rock Port Dickson t shirt! 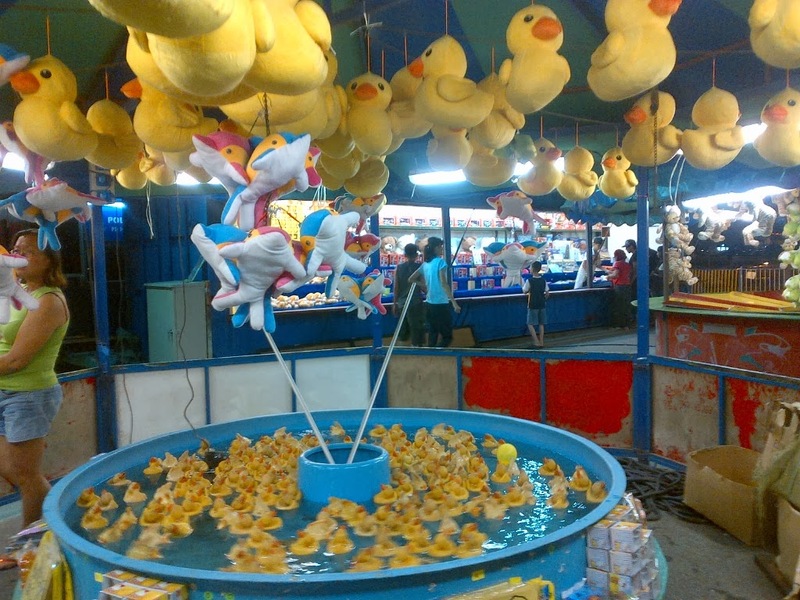 ), floats, kids' swimming suits, balls, magnets etc. I bought a pink ball with Minnie Mouse and Daisy Duck for Babycakes and also two pairs of leggings for RM10 each. 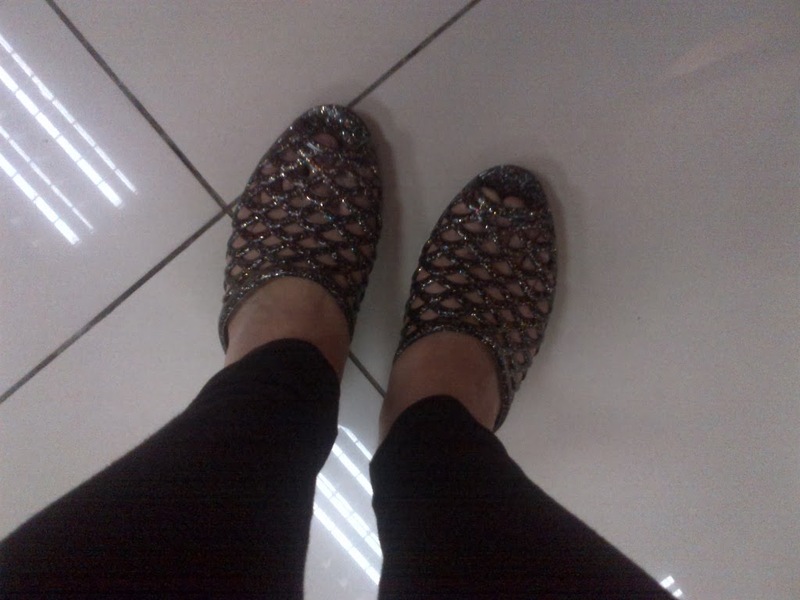 I also bought this slippers for RM6 because my sandals were sandy. We got into the car and went to PD Waterfront. Last time we went there, there was a funfair so we hoped there is one and what luck, there is! There were not many people so we had a nice time. A token is RM2 and some rides require 2 tokens. Babycakes wanted to play with these ducks because she was excited to see so many ducks! I went on the train and dinosaur rides with Babycakes and then I got dizzy because of the dinosaur ride. So I asked hubby to take Babycakes on the Ferris Wheel. 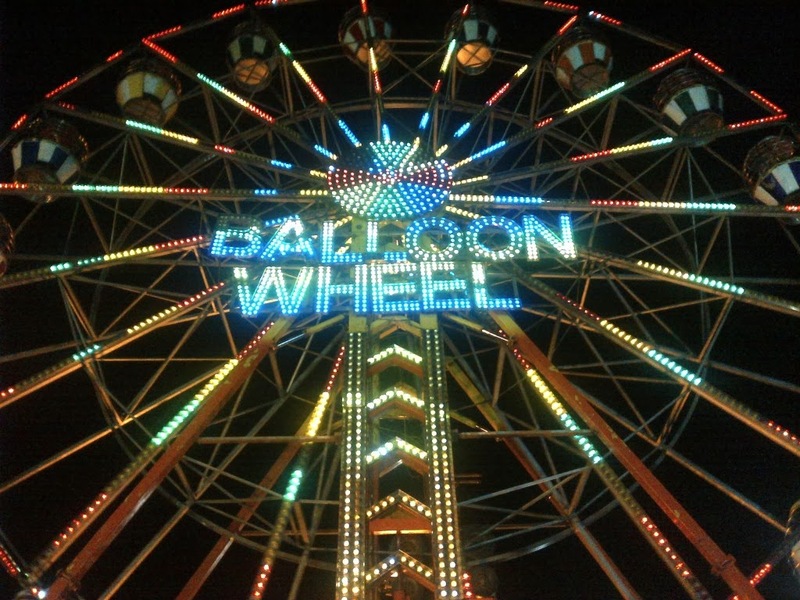 I wonder why they call it balloon wheel though. Besides, I am kinda scared of heights. 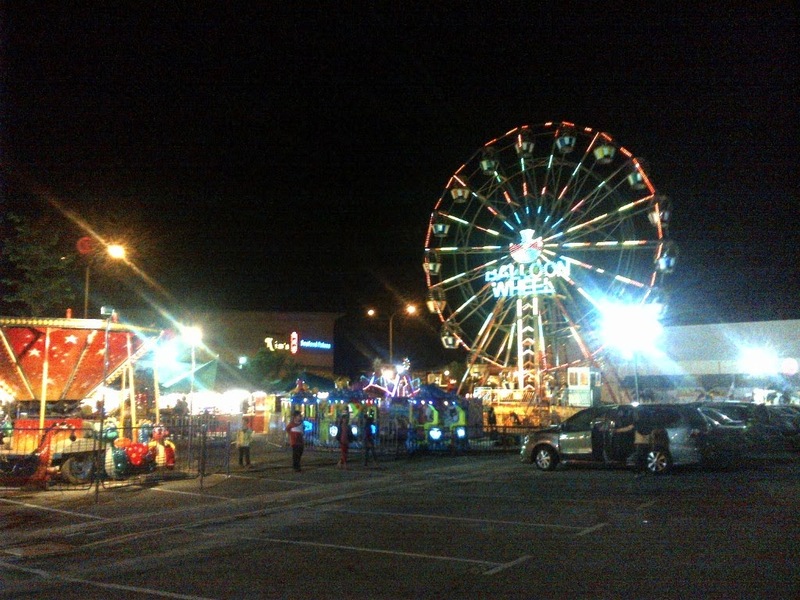 -___- The Ferris Wheel operator said it will take 5 spins but it was definitely more than 5 spins. After that, all three of us went on a boat ride which spins. Basically most of the rides spin so that got me dizzy again hahaha. After that we head home. Babycakes wanted to play even more but there weren't that many rides and she's too small for one of the rides. Next time I want to book a hotel and we can stay and enjoy the beach and explore PD a little bit more.